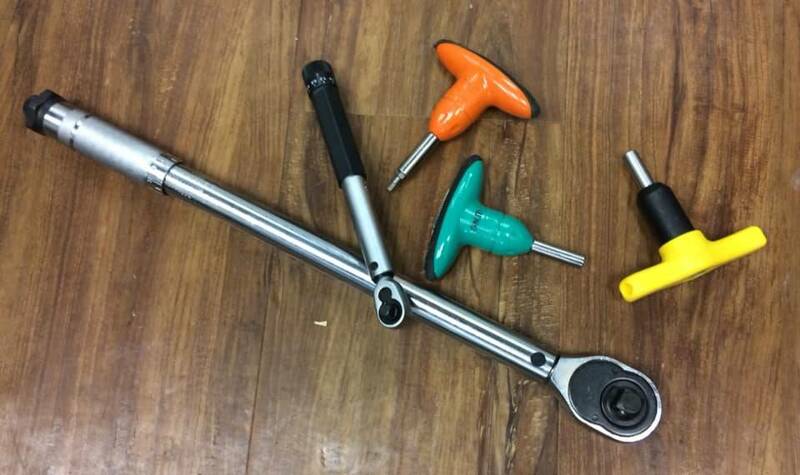 Torque wrenches come in many shapes and sizes. Some are measured in Newton Meters, others in Inch-Pounds, or Foot-Pounds. Some are adjustable, and some are fixed to a certain spec. It doesn’t really matter what type you use, as long as you are following the part manufacturers proper guidelines for torque. If you run into a situation where the part calls for Newton-Meters and your wrench only does Inch-Pounds; there are handy dandy online calculators to get you the conversion from metric to imperial torque! Pictured above are a few torque wrenches we use at the shop. The giant one is not used often, but handy to have when working on cranks and other large items.